Casio's latest special edition women's watch is this special Baby-G piece made in collaboration with fashion brand Married to the Mob by Leah McSweeney. Casio's durable G-Shock and more feminine Baby-G collection of pieces have proved to be highly malleable designs when it comes to creating special models. engraved on it. Further Married to the Mob (MTTM) branding is on the strap. It is a very fun looking watch that will appeal to brand enthusiasts as well as others who enjoy the power purple look on the case and strap. The watch itself has a series of functions found in most Baby-G watches including the time, calendar, stopwatch, alarms, world time, and more. The watch will be available at select Nordstrom, Bloomingdale's, and Macy's stores starting about now for the price of $99. Ariel Adams publishes the wrist watch reviews site aBlogtoRead.com. 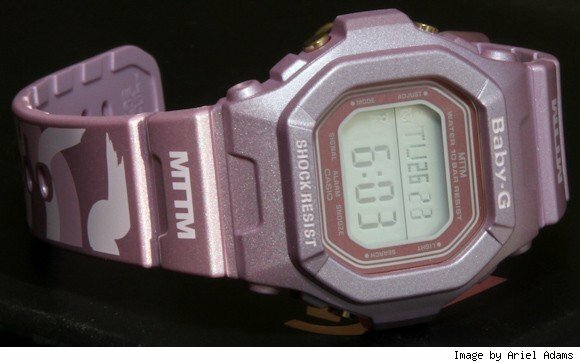 Casio Baby-G Watch For Married To The Mob Designer originally appeared on Luxist on Thu, 28 Apr 2011 12:01:00 EST. Please see our terms for use of feeds.